Ok, someone has got to explain this whole Google Authorship markup thing to me. I’ve been trying for nearly a year to get a client so that his picture shows up with his articles the way one of his competitors’ does. In doing some research today to see how other SEOs make this happen, I turned to my favorite search engine news site: http://www.searchengineland.com. I see that my most recent article, “How to Stop the Panic When Asking if You’ve Been Panda Slapped” is showing up in the results, but my author tag isn’t showing my picture or my name. So I figure maybe I’m just not worthy enough. I went and pulled one of Danny Sullivan’s articles instead. 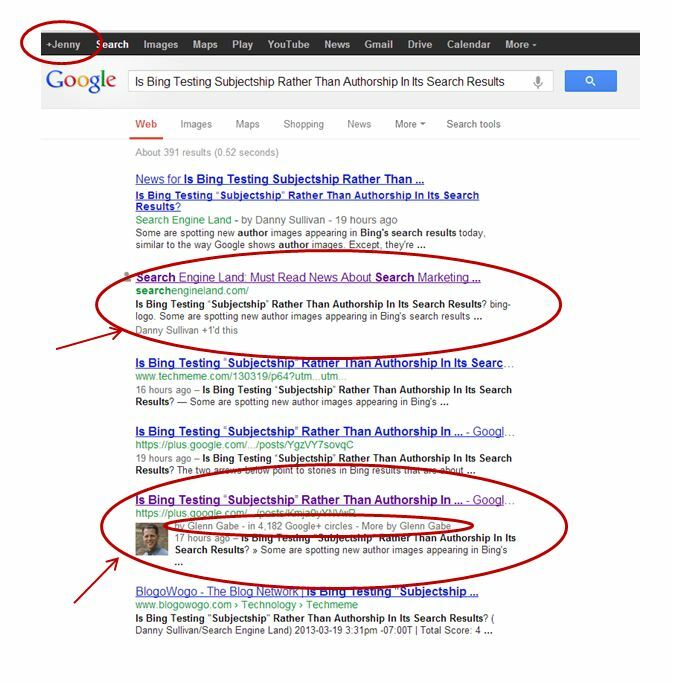 I confirmed that his author tag is on the article, and did a search in Google for the article name: “Is Bing Testing Subjectship Rather Than Authorship In Its Search Results”. The article comes up second as you can see below, just under the news result. But it doesn’t have Danny’s name or picture. But in the #5 spot, there is a picture! Of someone who shared the article on Google plus. It’s marked up like this person owns the article, when all he did was share it. I’m signed in to G+, but this person is not in my circles. So I ask you – WTF? Maybe someone who knows more about authorship markup can shed some light here? Now I can see that you have a link to SEM in your Google+ profile, but perhaps if you delete it and re-enter it, or perhaps enter it slightly differently, maybe that can help? I think the problem with that particular article was that the author tag wasn’t linking to the right place. I’ve updated it and we’ll see if we can get it fixed. Still, I think that’s distracted everyone from the point of my article – why would google display someone else as the author of Danny’s article? My understanding is that you have to do a two way authentication – verify it both in your G+ account as well as on the blog you’re posting to. They need to do a handshake. Also, this might sorta be like a schema tag thing where you need to tag ALL of your pages (blog pages that is), not just one. When we’ve tried to implement schema on one of our sites as a “test”, it didn’t work. At SMX West they explained that you can’t just test a few pages, you need to do them all, otherwise they don’t get picked up for some reason. I hope you figure it out as I need to get this done for our corporate blog soon! Hey Linda, Yeah, I know you’re right on that. But all of SEL’s pages are tagged with the corresponding author, and Danny has SEL listed as a site he contributes to in G+. This is actually very common. When you’re logged into a Google account, Google usually won’t display an Author Rich Snippet for your content or the content that people you’re connected to have written. I think the line of reasoning is that, if you already know the person, they don’t need to promote them to you other than showing that little “person silhouette” next to the result to show that it’s a personalized result. When I search in incognito mode, I get Danny’s snippet, but in some cases, Google is returning Danny’s post as a news result. In that case, it’s not eligible for an Author Rich Snippet, though he is still listed as the author. Overall though, you can’t expect Google to return the same snippets (let alone results) consistently. Everything is designed to provide a better list of choices based on how that query is interpreted. I hope this answer is helpful (it probably isn’t. lol). Happy to take a look at your client who’s having trouble if you want. First of all you can not control when Google will show the AuthorShip snippet. The only thing you can do is to make sure the you’ve implemented it correctly. Secondly, what you see is a personalized result. Try to log out and see if there is a different result. Also try it with impersonal.me. Thanks for the comment, Lars. I did log out as mentioned above, but then I got no rich snippets at all. impersonal.me is cool! Thanks for sharing that; saves a few steps with the logout/incognito mode if I just want to do a quick check on something.